It seems to be a trend with Western stage magicians to try to prove there is no such thing as “real” magic. Harry Houdini exposed fake mediums and the Amazing Randi has “offered” a million dollar prize to anyone who can demonstrate paranormal powers to his satisfaction. American amateur magician John Keel was also a debunker. As a child growing up in Hornell, New York, Keel became fascinated by Houdini and was soon impressing other kids with illusions and “magic” tricks. In earlier days, he dreamed of traveling the Orient and uncovering secrets of the magicians. After military service in Germany, the 24-year-old Keel saved a little and embarked on what would be a 4-year quest, hoping to pay much of his way by writing adventure articles for magazines. Money soon ran out and his agent had a hard time selling his work. Keel tried to find work in Egypt but without success. His lovely German girlfriend came to stay for awhile but she was forced to choose between Keel and not starving to death. To say Keel went through a rough patch is an understatement but nonetheless his passion for magic and mystery only grew. “Skepticism is blinding. Teach yourself to be curious, not skeptical. You will learn more because you will see more. You thought the rope trick was impossible. Now you know you can do it yourself. There are many things that seem impossible to us… but if you reach for your untapped resources, if you think with all your brain, you wil find the answers and more besides”. Keel was a good writer and his agent eventually sold his articles back home. Each paycheck got him a little further on his way; from Cairo to Bagdad and then onto Bombay and the Himilayas. His experiences are collected in a work called Jadoo, a truly fascinating tale of a young man finding what many consider to be “impossible”. Keel met an elder “Sheikh” named Abdul Mohammed who could tell him the exact amount of money he was carrying in his pocket and the precise amount of emergency cash he held in his watch purse. He met monks near Tibet who could “see” things at great distances such as a fire tragedy that was happening in a faraway village. Keel later confirmed this remote viewing. In Singhik, he met a “simple lama” named Nyang-Pas who said he could read minds. “Try to clear your mind of all other thoughts and think of (an) object”, the man said. Keel thought of a tree. “That’s too easy’, the lama said. “You are thinking of a tree”. Keel then focused his mind on a pair boots. “Now you are thinking of a pair of boots”, said Nyang-Pas. “In a monastery above Changthang… something thumped loudly on the roof overhead, then a small stool in the corner of the temple started to move slowly across the floor toward me. It came within a foot of me and then slowly circled around me. I passed my hands all around it. There didn’t seem to be any threads or mechanisms of any kind. It was just a plain three-legged stool. It moved on to another corner and stopped. Later I examined it carefully but couldn’t find any sign of trickery”. Fortunately for the young Keel, he did not consider himself an “authority on anything” and was open to a larger reality. …He was dressed in a corduroy hunting jacket, and gave the appearance of being long and lean with a promounced ‘writer’s stoop’ from years bent over a typewriter. Later I learned that, like many writers, he was a night person and usually had breakfast around 3 or 4 in the afternoon. “I see you’re not wearing your black suit today,” he chided, and I knew I immediately liked Keel. Unlike many UFO investigators, he had a good sense of humor”. John Keel would go on to study UFOs and his investigations into the 1966 paranormal hotspot known as Point Pleasant, West Virginia formed the basis for his infamous book, ‘The Mothman Prophecies”. As an investigator in this case, Keel went through much emotional turmoil as he was given an ominous message there would be a tragedy on the Ohio River. He thought it might be a disaster involving the nearby chemical factory but in 1967 the Silver Bridge collapsed killing several people. During the time of the “winged” Mothman and UFO sightings, Keel kept getting messages and phone calls from what seemed to be a “non-human” entity. Keel must have wondered if it was really just a friend, the hoaxer Gray Barker. Barker later admitted there was a phone call to Keel on his phone bill but said he had no recollection of making the call. Keel might have suspected Gray Barker in this case but things got weirder still when the caller could tell the investigator what he was hiding in his shoe! “At one point I got disgusted with the telephone and I pulled it out of the wall and the phone rang! So explain that… I was going around taking phones apart. In those days you could easily take them apart; with modern phones you need special tools. That little incident is in the movie”. (Interview with Art Bell on Coast to Coast AM, 2002). 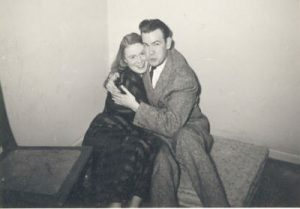 John Keel with girlfriend Lite (Lita). After travelling “the Orient”, Keel settled in Europe for awhile and wrote Jadoo. According to Colin Wilson (in his book “Alien Dawn”, page 161), John reunited with with his German lover Lite for awhile, to whom he dedicated the work. The chapter on his romance with Lite was originally deleted but is now in the re-published version. “…they were afraid of the devil and didn’t want to anger him. They knew about God and believed in Him. But they reasoned God was good and therefore harmless. It’s the devil they worried about”. 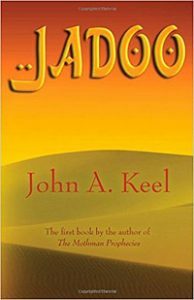 Indeed, the word “Jadoo” is a Hindi word for “black magic” but reading through Keel’s book is more of a positive experience. Keel traveled to some amazing and beautiful places until he was finally branded an “undesirable alien adventurer” at Singnapore and was shipped unceremoniously to Italy by British authorities who likely thought they were doing him a favor. 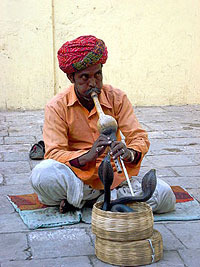 For a short time in the late fifties, Jadoo made John a celebrity interviewed on radio and television. 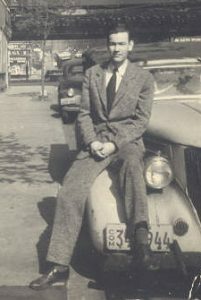 Eventually, Keel would write several books, contributing important perspectives to the UFO field, and he would be instrumental in resurrecting the New York Fortean society. 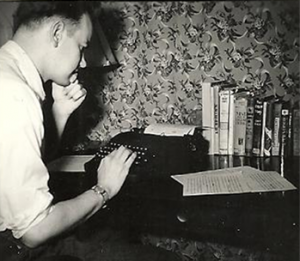 He wrote for television and as a journalist investigated “human interest” pieces for magazines. John was also a favorite on the lecture circuit before passing away at the age of 79. 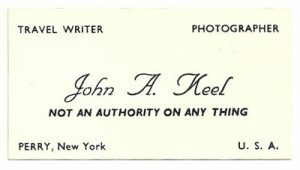 For more information on John Keel, please visit the John Keel Website.